Currently, there’s no Hawaii consumer-related tax tied to electronic smoking devices, known as e-cigarettes. But there ought to be. State lawmakers prepping for next year’s legislative session should draft a bill that imposes hefty taxes as a means to discourage escalating use among youth in the islands. 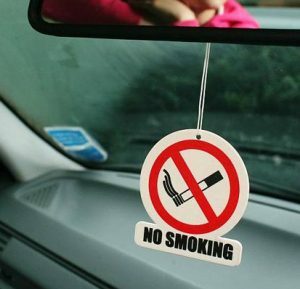 City officials said enforcement of a new ban on smoking in cars with keiki will begin immediately without any educational or warning period. 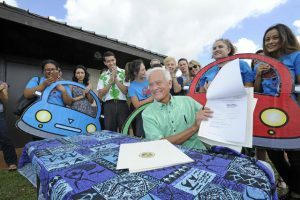 Mayor Kirk Caldwell signed Bill 70 into law Tuesday at Waiau District Park in Pearl City. The site was chosen partly because it’s a park where people go to enjoy fresh air, something youths under 18 can’t do when sitting in a car or truck where an adult is smoking, he said. “They have no alternative, and they have to breathe in that secondhand smoke, and we know it can cause huge health problems down the road,” Caldwell said. 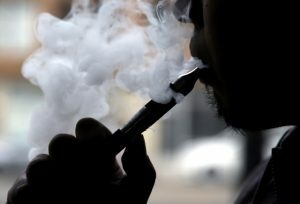 The bill applies not just to tobacco, but electronic cigarettes as well. The fine is a maximum of $100 for a first offense, $200 for a second offense within a year and $500 for a third offense. While some have questioned how the new law will be enforced, Caldwell said it’s obvious that Honolulu Police Department officers will be able to see right away if there is an adult smoking in a car while in the presence of a child. “If you’re caught breaking the law, you will be fined,” he said. However, he said, he’s hoping people will choose to abide by the law on their own. City Councilman Brandon Elefante, the bill’s author, said smoking in a car emits 50 times more particles in the cabin of a car than are emitted by a car’s tailpipe. 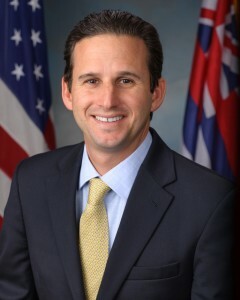 He applauded groups who supported the bill, including the Coalition for a Tobacco-Free Hawaii and the Hawaii Public Health Institute. Also on hand at the signing were representatives from the University of Hawaii Student Health Advisory Council and the American Heart Association. The Council voted 8-0 to approve the measure Oct. 11. Opponents of the bill argue that it is an unnecessary intrusion into people’s personal lives. Among those who testified against it was the Hawaii Smokers Alliance and the local owner of a chain of electronic vaping shops. Hawaii is one of just five states that require you to be 21 in order to purchase tobacco products. It’s been over a year since the state raised the minimum age. Have businesses been following the rules? The Department of Health, University of Hawaii, along with local law enforcement are working to make sure tobacco products stay out of the hands of minors. Hawaii is one of the only states where you have to be 21 to purchase tobacco products, from cigarettes to e-cigarette liquid. To make sure these products are only purchased by people over 21, teams of undercover officers and their underage accomplices conduct stings operations weekly. From July 2015 to June 2016, over 1,000 sting operations were conducted with 40 clerks getting a citation. 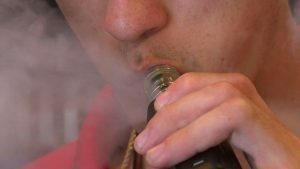 Hawaii teens who use e-cigarettes are more likely to have asthma, according to the latest research by the University of Hawaii. UH scientists who studied a statewide sample of 6,089 high school students found that teens who used e-cigarettes were more likely to report having the chronic disease, which narrows the airways and restricts air flow into the lungs. The potentially dangerous condition often results in coughing, wheezing, chest tightness and shortness of breath. If you’re younger than 21 years old, you won’t be able to buy cigarettes in Oregon anymore. The Oregon House passed Senate Bill 754 by a 39-to-20 vote on Thursday, acccording to KTVL. The new bill will go into effect as soon as Oregon Gov. Kate Brown signs the bill. A 2015 survey by the state Department of Health revealed that roughly one in every four Hawaii teenagers has used an E-cigs, a percentage higher than the national average. The data is the most current available, but judging by what’s happening on and near Hawaii high school campuses, a growing number of teens are vaping. Pick a popular spot, one where groups of students congregate, and you’ll see a common sight: teens passing around E-cigarettes like they’re sharing a bag of chips. Hawaii is the healthiest state in the nation for the fifth year in a row, according to the United Health Foundation’s 2016 report. 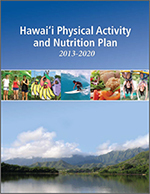 The state Department of Health said Hawaii has remained among the top five healthiest states in the foundation’s report since 2003. Since the report’s inception, DOH said Hawaii’s rank has varied from first to sixth place. Hawaii’s 2016 rank did not change from 2015, and it beat other top-scoring states such as Massachusetts, Connecticut, Minnesota and Vermont. Hawaii’s adult smoking rate has dropped 17 percent in a decade to one of the lowest in the country, and the state will now focus its efforts on specific groups that haven’t kept up with the societal shift, including Native Hawaiians. 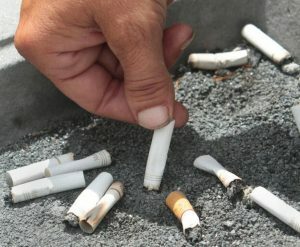 “While we’ve made great strides in lowering smoking rates and improving related health outcomes, these benefits are not reaching everyone in our state,” said Dr. Keawe Kaholokula, who chairs the Coalition for a Tobacco-Free Hawaii and the University of Hawaii medical school’s Department of Native Hawaiian Health. He spoke at an event Thursday at the Capitol marking the 10th anniversary of the passage of Hawaii’s Clean Indoor Air Act. The gathering celebrated the state’s progress and unveiled the state’s 2016-2020 plan to help “priority populations” avoid or overcome nicotine addiction. 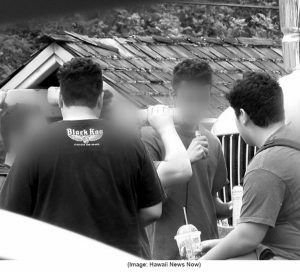 LIHUE — It is now illegal to smoke in the car with minors on Kauai. On Wednesday July 20th, the Kauai County Council voted 6-1 to approve Bill No. 2629, which prohibits smoking in cars with children under the age of 13. Supporters of the bill said it protects children from secondhand smoke by giving them a say in what happens around them. Justin Kollar, prosecuting attorney for the County of Kauai, who supports the bill, said he is satisfied that the council was able to find a compromise. Some 45 percent of Hawaii public high school students reported using e-cigarettes at some point in their lives, and 1 in 4 said they had used them in the last 30 days, according to a newly-released survey. The sobering statistics come as the use of regular cigarettes continues to decline among teens. Just 9 percent of Hawaii public high schoolers reported smoking at least once during the last 30 days. That’s down from 28 percent in 1993. The figures were included in an annual survey of teens’ health behaviors, and could spur more efforts to address e-cigarette use among teens. 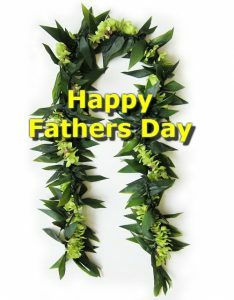 Father’s Day is a day to celebrate dads for who they are and all of the wonderful things they do. It is also a great time for dads to remember the important role they play in influencing the choices their kids make regarding tobacco use. Unfortunately, tobacco use among men remains a serious problem: nearly one in seven men in Hawaii currently smoke, killing 800 every year. Dads who smoke can celebrate Father’s Day by quitting; and all dads—smokers and nonsmokers alike—can celebrate Father’s Day by taking a number of effective actions to protect their kids from becoming another one of the tobacco industry’s addicted customers and victims. Even if they smoke, what dads say, how they act and the values they communicate through their words and actions greatly influence whether or not their kids will smoke. 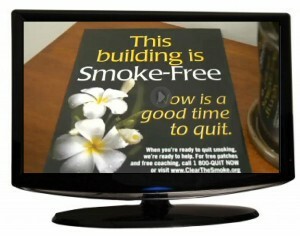 The Hawaii QuitLine offers free counseling and quit smoking aids and can be reached at 1-800-QUIT-NOW. When you come upon an ocean bay that has features known as “Toilet Bowl” and “Witch’s Brew,” you may not envision a welcoming tropical oasis. 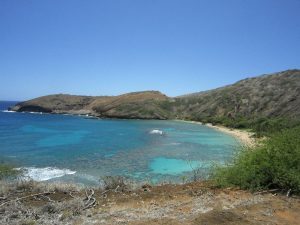 But Hawaii’s Hanauma Bay, nestled inside a breeched volcanic cone on the southeastern shore of Oahu, has some of the state’s calmest waters, most pristine beaches and world-renowned snorkeling over coral reefs that teem with colorful fish. The known facts on the health effects of electronic cigarettes — “e-cigs” — are relatively few. In that context, the release of new regulations governing their manufacture and sale makes sense, as long as the process can be streamlined a bit to eliminate extraneous bureaucratic procedures. 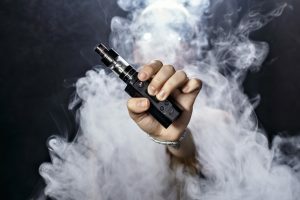 Oversight is especially needed concerning the production of the liquid that the battery-powered e-cig devices turn to gas for “vaping.” It’s impossible to gauge the health effects of vaping — and how they compare with the known threats of tobacco smoking — if authorities don’t know what’s being inhaled. The federal Food and Drug Administration last week announced the new regulations requiring, among other things, that manufacturers submit their products for a safety review. Mother’s Day is a day to celebrate moms for who they are and all of the wonderful things they do. 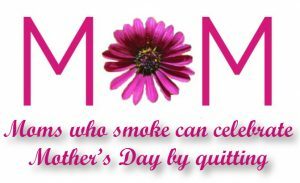 It is also a great time for moms to remember the important role they play in influencing the choices their kids make regarding tobacco use. Unfortunately, tobacco use among women remains a serious problem: over 18.5 million women currently smoke, an estimated 200,000 women die every year from smoking, and more than 86,000 kids have already lost their mom to smoking. 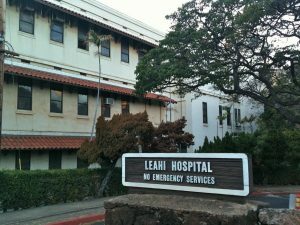 Employees, visitors and patients at Hawaii Health Systems Corporation hospitals would be prohibited from smoking anywhere on the premises under a bill that is headed for Gov. David Ige’s desk after it was approved 21-0 on the Senate floor on Friday. Senate Bill 305 would ban the use of tobacco and electronic smoking devices inside and outside of the 13 HHSC facilities in the islands. 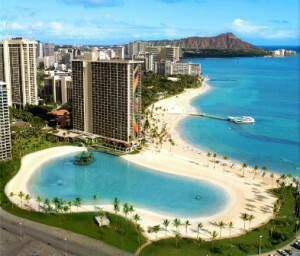 The HHSC facilities on Oahu are the Maluhia and Leahi hospitals and Kuhuku Medical Center. Smoking would also be prohibited in all visitor and employee parking lots. The measure defines electronic smoking devices as any electronic product that can be used to disperse and deliver nicotine or other substances to user. This includes but is not limited to electronic cigarettes, electronic cigars and hookahs. With a new year will come a new law — Hawaii will soon make history as the first U.S. state to raise the legal smoking age to 21. The new law goes into effect on Friday, January 1st. 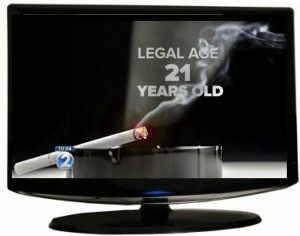 Tobacco products, including electronic cigarettes or e-cigs, can only be sold to people who are at least 21 years old. 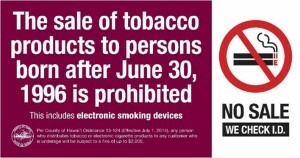 New signs will be up in stores, telling customers about the new legal smoking age. “Anyone who looks under the age of 40, we ask for an I.D.,” said Ashley Agag, cashier at Times Supermarkets. Cashiers at Times will continue to do that, as the tobacco laws change. “People who do not look over 40, they actually have their I.D. ready, so I’m glad they’re prepared to show me their I.D. so I don’t really have to ask,” Agag said. 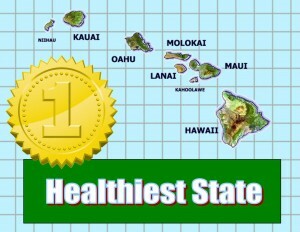 For the fourth year in a row, Hawaii ranks as the healthiest state in the country, according to a new report. About three decades after Congress mandated a nationwide 21-year age limit for alcohol, 10 senators are proposing a bill that would similarly force jurisdictions across the country to block sales of tobacco products to young adults. The senators, all Democrats, introduced the Tobacco to 21 Act on Wednesday. It would establish the new national age limit and allow the Department of Health and Human Services to ensure compliance. 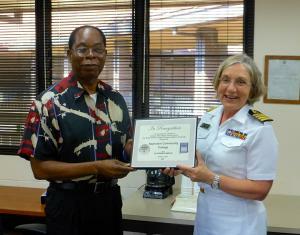 On Monday, August 3, 2015, Kapi’olani Community College was declared a Platinum Campus by the U.S. Department of Health and Human Services, Office of the Assistant Secretary for Health, for being a tobacco-free campus. Gov. 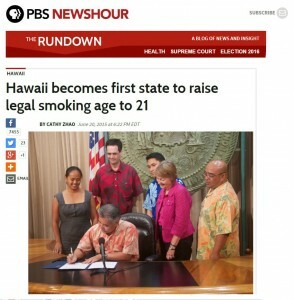 David Ige of Hawaii signed into law Friday a bill that raises the age at which people in Hawaii can legally purchase, smoke or possess cigarettes and electronic cigarettes. Although various local governments such as New York City have raised the legal smoking age in recent years, Hawaii is the first state to outlaw the sale and use of tobacco products to people under 21 years of age. The Hawai’i Department of Health says it applauds Gov. David Ige, members of the legislature, and partners statewide for passing and signing Act 19 (HB 940), which restricts the use of electronic smoking devices, or e-cigarettes, in all locations where smoking is illegal. Act 19 upholds the protections created by Hawaii’s very successful Smoke-Free Workplace and Public Places Law, enacted in 2006. The signing of this historic legislation makes Hawaii the fourth U.S. state to have passed such a bill, after North Dakota, New Jersey, and Utah. Cleaner air and a cleaner aina. 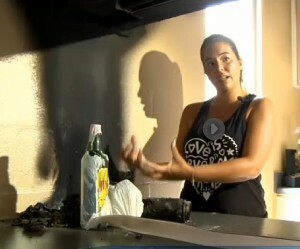 That’s what University of Hawaii officials say a smoking ban will mean for their Manoa campus. On Monday, students learned that Manoa will become a smoke-free campus beginning July 1. That applies to all indoor and outdoor areas. 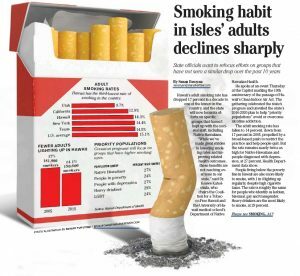 Since 2005, the Hawaii Tobacco QuitLine has helped 22,000 people stop smoking. Counselors field 400 calls a month from others wanting help. But the money that pays for the QuitLine and other cessation programs has dropped dramatically. Mayor Billy Kenoi has signed a bill that makes Hawaii County the first in the state restricting the use of electronic cigarettes to the same places traditional tobacco cigarettes can be smoked. The bill had squeezed through the County Council last month on a 5-4 vote. Proponents praised the measure as a way to make Hawaii County healthier, especially for children. How effective is Oahu’s smoking ban? The new year is a time for resolutions and some may want to give up smoking. It is something Oahu started banning at beaches and parks a year ago. But how is that law working out? E-cigarettes have been marketed as a way to help smokers stop using traditional smokes, but experts at the Hawaii Department of Health say neither one’s any good for you. 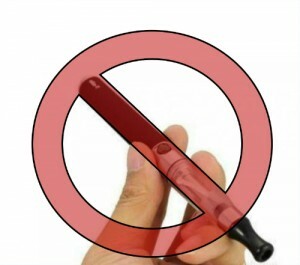 Electronic cigarettes, also known as electronic smoking devices or e-cigarettes, are now prohibited in all state government buildings under the jurisdiction of the Department of Accounting and General Services (DAGS). The new policy went into effect this month and is part of the State of Hawaii’s commitment to keep workplaces and public locations smoke-free. The policy sets the tone for private sector employers and others in the community to follow. 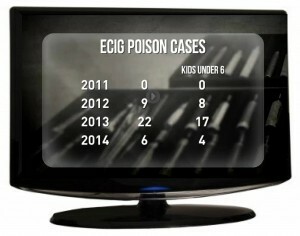 Along with the rise in the popularity of e-cigarettes, there has been a big increase in the number of young children poisoned by liquid nicotine. It is not just a trend happening in other parts of the country. It is also happening in Hawaii…. Some Honolulu City Council members are trying to raise the age of those who can buy tobacco products on Oahu. Council member Stanley Chang and Chair Ernie Martin introduced a bill Thursday that would raise the minimum age from 18 to 21. Similar moves have been made in other parts in the United States including the Big Island. “Why are you proposing this?” KHON2 asked. “Tobacco is one of the leading killers in the United States and 95% of all smokers become addicted when they’re under the age of 21,” Chang said. Hawaii County as of now prohibits the sale of tobacco products to anyone under age 21, becoming only the fourth municipality in the country to do so. Proponents of the new law said an age-21 minimum for smoking is a growing trend. Local health leaders including Director of Health Linda Rosen MD recognized CVS Caremark for their policy to stop selling cigarettes at their Hawaiʻi CVS Longs branches and 7,600 nation wide stores. Accepting the award was CVS Caremark Executive Vice President Jonathan C. Roberts. The Campaign for Tobacco Free Kids also recognized CVS Caremark with its highest honor, the Champion Award, for the company’s leadership in the fight to reduce the devastating toll of tobacco use in the United States. A bill that effectively bans tobacco use at county parks, beaches and recreational facilities in Maui County, passed second and final reading on Tuesday; Earth Day, in the Maui County Council. The bill gained approval after the receipt of more than 400 letters of testimony since the bill was introduced 42 days ago. There are growing concerns tonight over e-cigarettes. That’s because calls into the poison control hotline have spiked from people, especially kids, ingesting the chemicals. E-cigarette makers say their product is safer than tobacco, however the number of accidents with the e-cigarette refill is growing here in Hawaii and nationwide. Cotton candy, apple candy, Skittles, e-cigarettes come in all sorts of tastes. “The flavors are enticing to kids,” said Rex Benigno, 808 Smokes Owner. They smell sweet too, but kids may not realize it can make them sick or worse. Depending on the concentration and the size of the person it could only take about a tablespoon of the liquid to be fatal. The electronic cigarette business has boomed over the last few years, but the popular alternative to regular cigarettes is landing in the wrong hands. Retailers claim e-cigarettes are healthier for smokers because they don’t contain some of the chemicals that regular cigarettes do. You can smoke different flavors and still get a nicotine fix. After all, our public educational institutions are more than mere state agencies. They are models for our youth. Tobacco use is the single-largest preventable cause of disease and death in Hawaii, according to the state Department of Health. Clearly, the model we should encourage is tobacco-free. Hawaii’s beaches rank high on the list of the state’s finest assets, which is why community leaders here are right to rail against treating them like ashtrays. Smoking represents a threat to public health and, when cigarette refuse is lapped up in the waves, a poison for marine life. 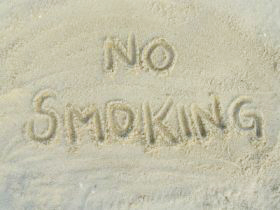 The instinct to safeguard the shoreline has produced smoking bans at Oahu and Hawaii island beach parks. But much more needs to be done, and soon, with the advent of new tourism markets being tapped in China and other countries where smoking is even more prevalent than it is here. Until Friday, the efforts had included a proposal before the state Legislature for a ban encompassing all beaches in the islands. House Bill 325 got its first hearing last week before the House Water and Land Committee and the Committee on Ocean, Marine Resources and Hawaiian Affairs. A new smoking ban goes into effect on Oahu on January 1st, making it illegal to smoke in all Honolulu city parks. Beginning January 1st Electronic cigarette users cannot puff in Department of Health properties or premises occupied by its employees. 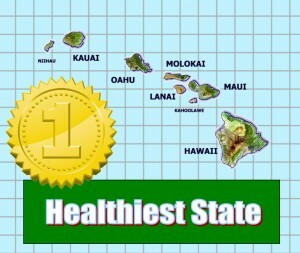 Hawaii is the healthiest state in the nation, while Mississippi brings up the rear, according to the 2013 America’s Health Rankings released today. 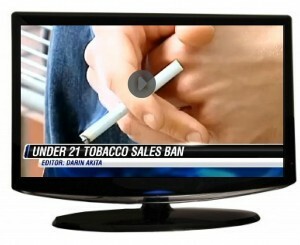 The Big Island will become the first county in the state to ban sales of tobacco products to anyone 21 and under. The county council unanimously approved a bill Wednesday that makes it illegal for retailers to market cigarettes, cigars, electronic cigarettes or other tobacco products to anyone under the legal drinking age. Only three other cities in the country have approved a 21 and under tobacco sales ban. Should e-cigarettes be treated the same as tobacco products when it comes to where they can be used, and even how they’re advertised? Hawaii’s Attorney General is joining the push to make that happen. A new law takes effect on Thursday. 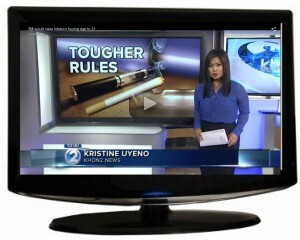 There is now an age limit in Hawaii to purchase an electronic cigarette. Tenants caught smoking three times or more in apartments or common areas at any of the state’s 85 public housing properties could be evicted under a tough new smoking ban effective this month. While each project will have at least one designated smoking area, the plan is drawing resistance from some residents, who say it is overly broad and especially difficult for the elderly, disabled and mentally ill.